Whether you've made an amazing chicken stock or have some left over from a recipe, you might be wondering what to do with it. Chicken stock or broth can be used for all sorts of delicious dishes. From a cooking liquid for grains like rice and quinoa to a braising liquid for chicken or vegetables, it's a very useful ingredient that brings extra flavor to a recipe. Braising meat means it is first browned in a skillet and then finished cooking slowly in a liquid. 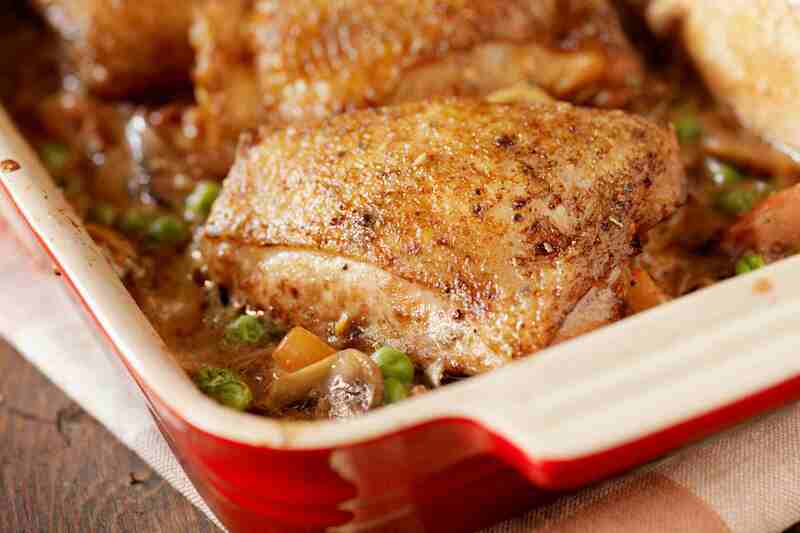 Braised chicken makes a fabulous dinner that is simple to prepare. This recipe uses a whole chicken, which is cut up and slowly cooked in chicken stock and white wine, making the chicken so tender that it falls off the bone. The flavors of onion, leek, garlic, rosemary, and bacon bring a richness to the dish. Roasted chicken is one of the tastiest, most satisfying dishes you can make and is delicious when served with a gravy. While you don't need a stock to roast a chicken, you do need it to make the garlic gravy that goes with it. By partially cooking the chicken with the chicken stock, white wine, and garlic, a flavorful sauce develops, perfect to drizzle over the cooked chicken. This classic Italian dish makes cooking chicken nearly foolproof. The flattened chicken breasts are dusted in flour and cooked quickly until browned. Then they simmer in a tangy sauce of chicken stock, lemon juice, sherry, garlic, onion, and capers, which is the key to this dish. Risotto is made by stirring hot stock into arborio rice and cooking until it's absorbed and the rice is nice and creamy. A chicken stock is ideal to use when making this simple risotto with chicken (you can use leftover roasted chicken, grilled chicken, or poached chicken breasts) and brings a nice, rich flavor to the dish which is enhanced by white wine, onion, and Parmesan cheese. For a simple side to go alongside any poultry recipe, glazed carrots are a great choice. This glaze is created with a sugar and chicken stock reduction and can be seasoned with your favorite herbs, such as mint, tarragon, or parsley. Make sure not to add salt until the end since the ingredients concentrate as the glaze develops; adding salt early on will make the carrots too salty in the end. Use up your chicken stock while you try your hand at some classic French cuisine. Ratatouille is a traditional dish featuring eggplant, tomato, and zucchini, ideal to make at the end of summer when the vegetables are bountiful. While it's often enjoyed as a side with lamb or poultry, it can become a meal of its own when served over rice or couscous. Rice pilaf refers to rice that is cooked by the "pilaf method," which means the uncooked rice is first sautéed in butter and toasted before a hot stock is added. This mixture is then baked in the oven until all the liquid is absorbed. It's a recipe worth learning because it is easy and a great addition to almost any meal. Brussels sprouts can be a little tough and need to be softened up before eating. Your chicken stock is the perfect liquid in which to braise the tiny cabbages until they become nice and tender. In this recipe, a little bacon gives the veggies extra flavor, creating a dish the entire family will enjoy. Quinoa is a fantastic alternative to rice, as it is highly nutritious, but it does need a little help in the taste department. Chicken stock not only makes it easy to cook up but also infuses a good dose of flavor. This recipe uses both white and red varieties of the fluffy grain and gets an extra boost from minced onion and a little butter. Serve it alongside a chicken or fish dish for a memorable, high-protein meal. All you need to create one of the five mother sauces of classical French cuisine is chicken stock, clarified butter, and flour. 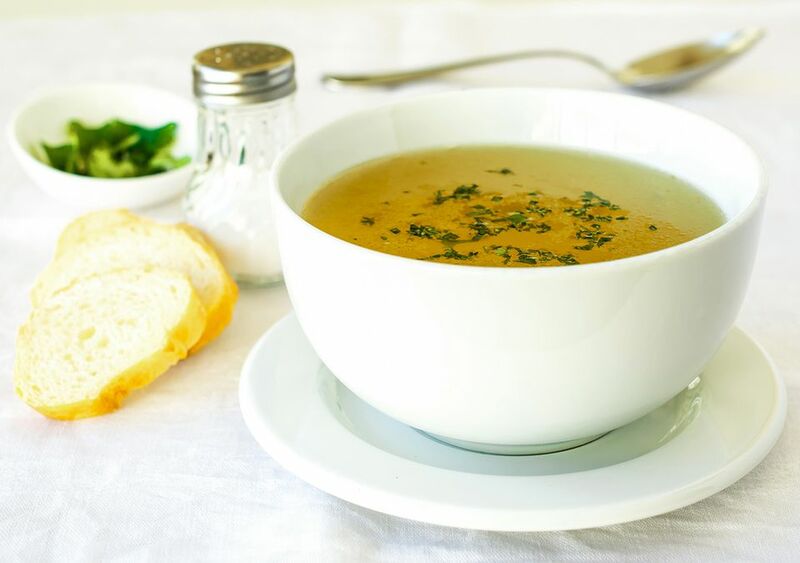 Velouté (pronounced "vuh-loo-TAY") sauce really is that easy and learning how to make it will make you look like a master chef! It's a fabulous way to dress up any simple chicken dish. When finished with cream, butter, and lemon juice, this sauce becomes suprême sauce, which is considered a secondary mother sauce.